← Icelandic Bank Collapse: Small, Expendable Country taken Down? Margaret Thatcher was, with Winston Churchill, the only world-historical political figure which came out of the United Kingdom in the 20th Century, British writer John O’Sullivan said to a meeting endorsed by RNH, but held by the Young Independents in Iceland on 13 October, Thatcher’s birthday. Whereas Churchill was President Roosevelt’s junior partner in winning the Second World War, Thatcher was President Reagan’s junior partner in concluding the Cold War successfully and giving freedom back to the oppressed peoples of Central and Eastern Europe. In the Falklands War and in the disputes with militant trade unionists, Thatcher also showed her resolution and courage, according to O’Sullivan. It had become essential to break the stranglehold unions had on British enterprise and to reverse thirty years of decline. 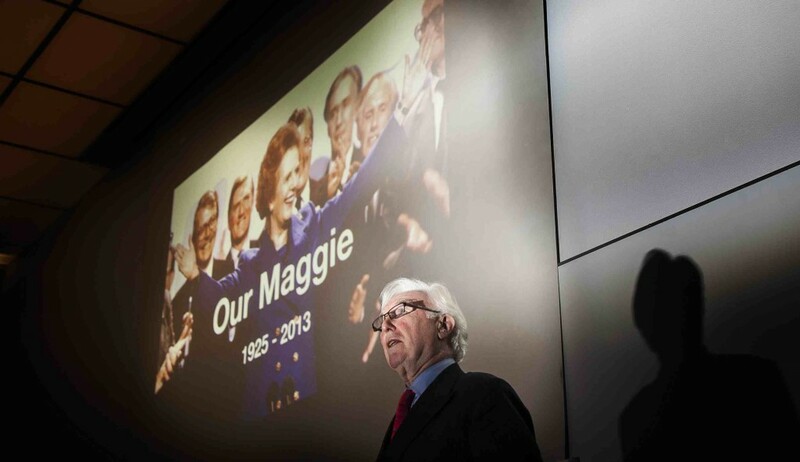 At the meeting, O’Sullivan—Thatcher’s friend and speechwriter while she was Prime Minister in 1975–90—give a spirited analysis and defence of Thatcher’s remarkable political career. According to him, Thatcher kicked up and kissed down: she could treat her distinguished colleagues in the cabinet and senior civil servants with brutality and even contempt, and should perhaps have done less of this, but she was always kind and nice to her chauffeurs, tea ladies and other members of her staff. Many documentaries about Mrs. Thatcher are available on Youtube. Before O’Sullivan’s talk, Icelandic Interior Minister Hanna Birna Kristjansdottir, who chaired the meeting, spoke about what an inspiration Thatcher had been to her and many other women in the fight for the equality which really mattered: the full and equal freedom of all, men and women, to pursue their interests under the law. Professor Hannes H. Gissurarson concluded the meeting by telling a few stories about his own encounters and discussions with Thatcher, and also about the relationship between Thatcher and Friedrich A. von Hayek, their common mentor on whom Gissurarson wrote a doctoral dissertation. Thatcher, the Baroness Kesteven, was the patron of AECR, Alliance of European Conservatives and Reformists, with which RNH is working on two projects, “Europe of the Victims”, and “Europe, Iceland and the Future of Capitalism”. The meeting on Thatcher’s birthday provoked much discussion. On 12 October 2013, the libertarian online magazine Andriki advertised it. 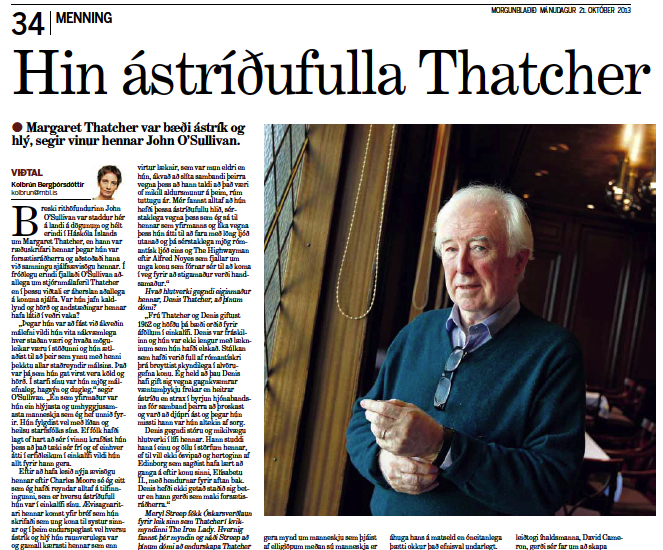 On 21 October 2013, Morgunbladid published an interview, conducted by journalist Kolbrun Bergthorsdottir, with John O’Sullivan on Thatcher, especially the personality behind the public image. O’Sullivan’s talk will be published in an Icelandic translation in the magazine Thjodmal.